Metro hosted a bike share demonstration at its headquarters building at Union Station on Wednesday to show agency employees and members of the public how various bike sharing systems work. It was the first time such a demo has been staged in the county’s largest public transit hub. See a short video of the demo on Youtube above. 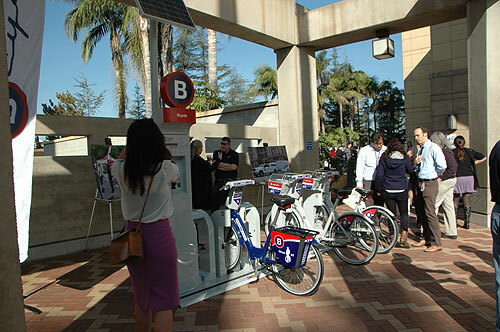 B-Cycle demonstration at Union Station's East Portal. The demo was planned in concert with the Metro Planning and Programming Committee, which approved the Metro Bike Program’s bike share strategy. The item goes before the full Metro Board for its consideration next Thursday. The report represents the first countywide effort to evaluate bike share concepts for Los Angeles County and looked at funding opportunities and operating models. If the Board approves the strategy, Metro will establish a Bike Share Working Group with members of interested cities, business organizations, advocacy groups and others to provide guidance and feedback for developing a Bike Share Feasibility and Implementation Plan. A company representative shows off the Bixi bike. Topics for the Working Group will be an interagency agreement that could define an organizational structure, financial commitments, policy direction, business model, phasing proposals, roles and responsibilities and funding opportunities. Incidentally, the cities of L.A., Santa Monica and Long Beach already have “start-up” funding from Metro’s Call for Projects to establish pilot bike sharing projects. 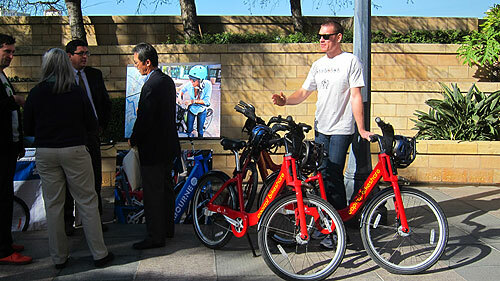 Representatives from bike share vendors provided demonstrations of their products either now under development or that been deployed in other cities both domestically and abroad. 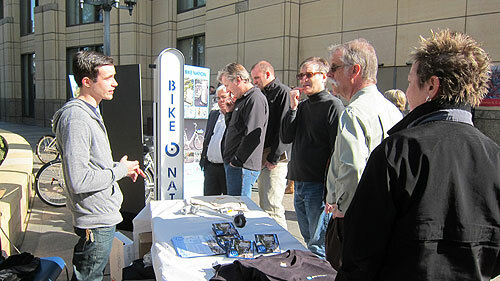 a Bike Nation representative explains his product at the demonstration. I wish I had know this was happening, I would have popped over. I spent the last few years in Boston, and their new bike sharing program has exceeded expectations so far. It’s a great way to get around (despite the new england drivers) and helps make up for the lack of 24 hour service. have to buy an expensive bike so just ask or go to the Metro’s Info about it. so Keep up the Good Work Los Angeles and make this City Healthy and getting out of their Cars and ride their bikes and make the Air Clean. Hope they go with Bixi. Its vastly superior to the other systems and has a proven track record in DC, Montreal, London, and Boston. Learn from these other cities, and stick with what works. Proponents of this service should remember well that bike sharing has failed in two locations: Vancouver, BC and Australia. Why? Because the local governments require helmet use for adults. Bike share has not failed in Vancouver, BC. Metro is definitely doing their share to promote healthy alternatives when living car-free in Los Angeles (the car capital of the world). Bike sharing is growing worldwide, just as carsharing has. Now with Metro, LAXCarShare and Bike sharing, we can make serious headway in reducing traffic congestion in the LA Metro area. Keep up the great work!